Across government, departments are beginning to realise not only the value of the data they hold, but also how they can use data science to make more effective, data-informed decisions. The Government Data Science Partnership is a collaboration between the Government Digital Service (GDS), Office for National Statistics (ONS) and the Government Office for Science. It was formed to help government realise the potential of data science. And to support the development of skills and tools to kickstart greater take-up across departments and agencies. How are we supporting the community? In the past year, we’ve been focused on building data science capability, working with departments to develop projects, delivering training to build new skills and facilitating a thriving community of interest. We’ve expanded the Data Science Accelerator. It’s a capability building programme which gives analysts from across the public sector the opportunity to develop their data science skills. They do this by working on real business challenges with the support of experienced mentors. This year, we’ve scaled our Data Science Accelerator hubs across the UK from three to five. Our hubs are in London, Newport, Bristol, Sheffield and Newcastle, and to date over 60 civil servants have graduated from the Accelerator programme. 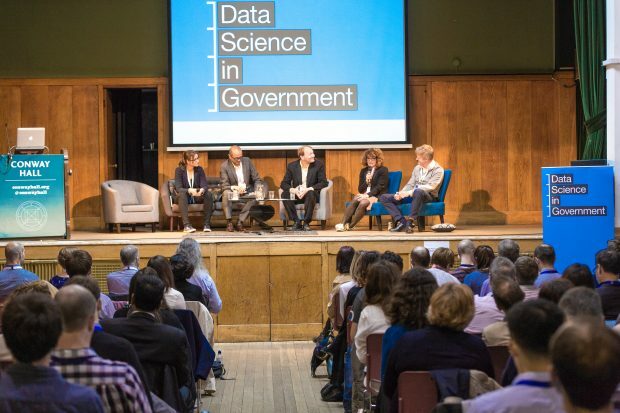 In April 2017, the partnership hosted the first Government Data Science Conference. We brought together over 250 data scientists, analysts and policymakers from across government to share knowledge and best practice, and to learn from each other. The conference featured over 30 talks. Our colleagues from the Department for Transport spoke about how they’re trialling using a mixture of natural language processing and topic modelling to automate some of the otherwise time-consuming manual work needed to collate and analyse policy consultation responses. Greg Haigh from the Department for Business, Energy and Industrial Strategy talked about a challenge his department faced to reach the almost 2.5 million households living in fuel poverty who are eligible for support. His team developed a machine learning algorithm using data from the English Housing Survey, National Energy Efficiency Data Framework and Ordnance Survey to identify the areas that would require support. We also heard from other government organisations on how they’re working to create a data-informed culture. David Dorrell from the Ministry of Justice talked about the three-year journey HM Prisons and Probations Service has taken to set up data science and analytics capability. Our colleagues from Defence Science and Technology Laboratory spoke about how they’re embracing open source and collaboration by launching an open data science challenge, which they’ll be working on with Kaggle. At a regional level, Plymouth Council told us how they’re taking an open and community-focused approach to data and digital innovation in town planning, on a limited budget. 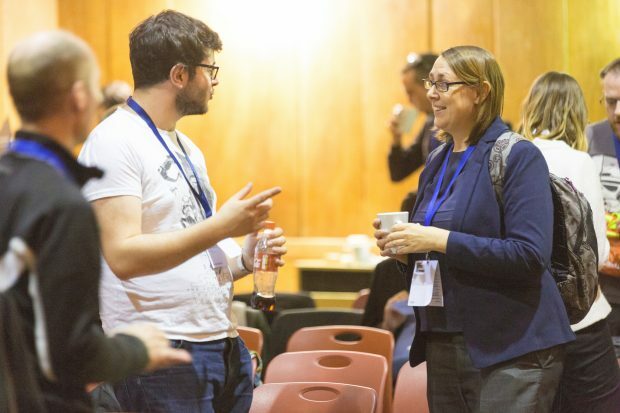 The Royal Statistical Society’s Data Science Section led a discussion featuring experts from academia and industry. It was about how we can build multidisciplinary teams of adaptive data scientists and analysts alongside decision makers who understand the value of data and can effectively commission projects. In March, the Digital, Data and Technology profession published a capability framework for 38 DDaT roles, creating a common set of roles, skills and career paths that every government department can use. The Government Data Science Partnership collaborated to establish the career path for data scientists in government as part of this work. We hope this will help recruit and develop data scientists in a consistent way by starting with a common understanding of the role. In addition to our annual conference, we’ve been growing the cross-government data science community of interest by holding regular show-and-tell events. These events bring together data scientists, analysts and policymakers interested in better use of data. We host the cross-government data science Slack channel where people share ideas, problems and recommendations with over 600 members. And we send out a monthly data science newsletter. Our focus this year is to build data science capability across government and improve data literacy among non-analysts. We’re connecting data scientists across government to enable peer support and peer learning. This year we’re continuing to run regular data science community meet-ups and ONS Data Science Campus seminars in England and Wales. The Government Data Science Partnership will also host a second Government Data Science Conference in 2018. To equip analysts and data scientists with the skills they need, GDS is continuing to run three cohorts of the Data Science Accelerator per year across the five UK regional hubs. The Government Statistical Service Learning Academy and the ONS Data Science Campus are leading the development of formal training and data science modules. They have created a new MSc in Data Analytics for Government open to all civil servants, and launched a pilot apprenticeship programme for data analysts. The Government Data Science Partnership is also supporting data scientists across government to deliver best practice work by developing and disseminating data science standards, guidance and frameworks. ONS are ensuring that learnings from academia and the private sector are brought into government through a series of collaborations with universities across the UK and the Alan Turing Institute. The Government Data Science Partnership is also supporting the third Data for Policy Conference, which is centred on the potential for algorithms and data science to transform government. We’re planning to enable a range of audiences to understand the data science opportunity to tackle policy problems and to support services. For the policy profession, we’re working with Civil Service Learning to deliver a knowledge series on data and better decision making in September. We’ll also be scaling existing training, in particular the ‘Art of the Possible’ – a course aimed at senior civil servants, which explains what new tools and techniques are covered by data science and the opportunities they present, so that leaders can provide a clear vision for their staff. To help operational and service delivery teams to understand how data science can help improve their services, we’ll be adding new data modules to the GDS Academy courses. Sign up to the cross-government data science community of interest here to learn more about events, projects and training we’ll be offering. The data science community of interest is open to UK civil servants only, so please register with a gov.uk email address. Hello. Please could you add @dvsa.gov.uk to the Slack channel approved list please. Hello. Please could you add @marinemanagement.org.uk to the Slack channel approved list please. Could you also add @gamblingcommission.gov.uk to the Slack channel please. Thanks. Could you add @newcastle.gov.uk to the Slack channel approved list please. Please can @hs2.org.uk be added to the Slack Channel. Hi Andy, that domain has been added.